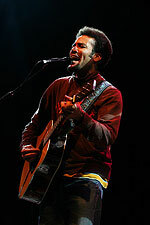 Went and saw Ben Harper last week, was absolutely unbelievavble! Without a doubt the best gig I've ever been to! He played for like two and a half hours, played pretty much all his good songs except Blessed to be a Witness, totally went nuts to Black Rain and My Own Two Hands/War then finished it off beautifully with Better Way, which is definitely up there with my favourite songs of his. He's a brilliant musician, great showman, and yet so much more deep than just a normal bloke singing songs. Some stuff that really does connect with you on so many different levels. Will definitely see him next time. Quality stuff! How many Ben Harper concerts, and things of the like, must Christians go to before they 'change the world with their own two hands'? Don't want to be cynical - but for all of us - how much of being a Christian is about lookin 2b cool and alternative more than keeping our eyes and lives on Jesus? How is loving Ben Harper, as much as we all do, not idol worship? Why are we all so star struck? Why do we idolize Christian singers and speakers and writers? We seek after the 'new cool thing' with the same fervor that the Lord demands we seek after Him! How do we carry a cross when our hands are full of cds and all our effort is workin on being cooler and when our brains are full of new Christian/Worldy terminology and feelings? Is it a consumerism? Are we being servants? This is something I'm struggling with. Do you have any alternative thoughts on this Digs? Jono.